Substituting sweet potato for (regular) potato? I recently made Hamelman's potato bread with roasted garlic (added dried parsley as well), and it was absolutely wonderful, and has me wanting to make more. Picture of said bread is included above for fun. With Thanksgiving approaching, I was wondering about sweet potato breads. I know that there are many recipes out there, but my question is about converting a recipe which calls for potato, and subbing in sweet potato. Are they interchangeable 1-for-1, or perhaps a different ratio due to different moisture content? I think I saw that Modernist Bread has a section about vegetable additives to bread, but I don't have access to the book now. If anybody has personal experience, or the MB conclusions to share, I would appreciate it. Thank you! is a slight delay with the rise of sweet potato dough so be patient. Lovely Said Bread! Just lovely. for the tip, and for the compliment! Great question and a gorgeous loaf. A sweet potato version would be fun to play with. I made the roasted potato chive version bread in Utah last month for my daughter and her in-laws, and they enjoyed it. 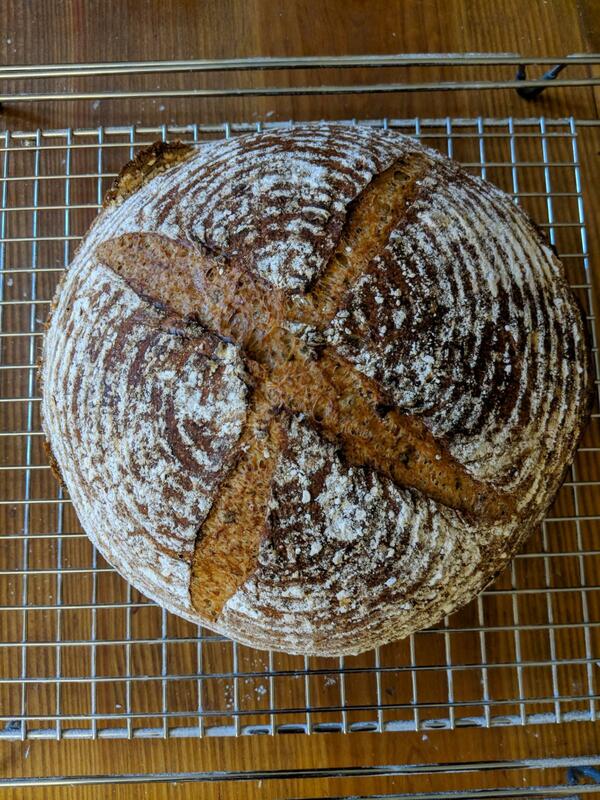 Figured it's a great recipe if it turned out well in a strange kitchen with store-bought (Whole Foods) flours, her inconsistent scale, my 37-year old small KA which she now owns, and 1 Cambro and 2 bannetons I hauled up there. No room in the RV for the Ankarsrum, though I did have a new pizza stone waiting when I arrived as they hadn't bought one yet. Mini, since the potatoes are pre-roasted, what in sweet potatoes causes the longer rising time? what causes the longer rise time. It could be a self defense mechanism in the plant chemistry against invading organisms and fungi found in dirt. isn't it?! Glad to hear that you had great results also. A quick google search yielded that the average sweet potato water content is close to 82%, while the average potato water content is 79%, although these figures obviously change with variety, etc. I'm planning on trying a 1-1 substitute using Hamelman's recipe tomorrow, keeping in mind Mini's advice, and possibly very slightly reducing the water. If I go through with the bake, I will be sure to post an update. roasted potato bread, with no adjustments (other than the sweet potato swap), and it came out quite well, but with just a hint of sweet potato flavor, and a nice yellowish crumb color. I think next time I'd like to up the % sweet potato, lower the water, and see what happens.